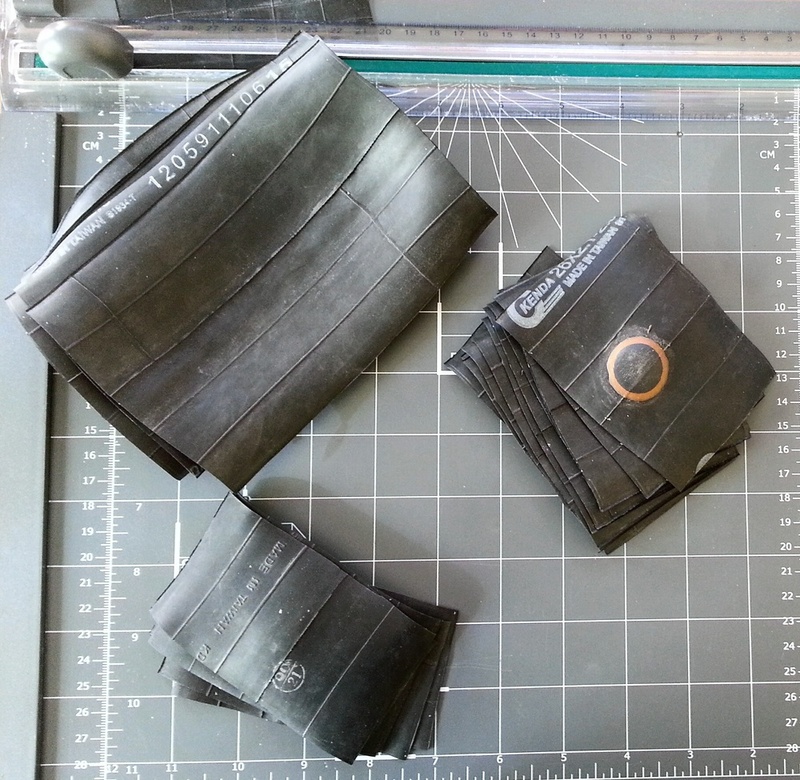 The recycled bike tubes I use to make my products are sourced from bike shops in Moab. Old tubes pile up in corners, boxes, and bins, and eventually shops have to throw them out. This is where I come in. The bike mechanics and shop owners seem to be happy to see me coming, and I'm happy to help them reduce their waste and keep this great resuable material from ending up in Moab's landfill. Collected tubes ready to be cleaned and transformed. The first place the tubes go is into my garage, where I cut off the valve stems and cut open the tubes. Next, into the wash they go to be thoroughly cleaned of dirt and talc (talcum powder is put into tubes during manufacturing to keep the rubber from sticking to itself). Once dry, they finally enter my workshop where they are sorted by size and then sewn together to create the final products. Along the way, holes and imperfections are cut out. I leave all the factory markings, brand stamps, and any patches still in good shape. This adds to the uniqueness of each bag and wallet, and serves as a reminder of your bag's origins. When cleaned, bike tube rubber has a lovely, supple feel, and over time will wear like a fine leather. Also like leather, it is durable, flexible, and strong. Unlike leather, it is easy to clean and care for, and it's waterproof! There is a slight rubber smell, but you really have to put your nose up to it to notice. For more, check out my FAQ page. 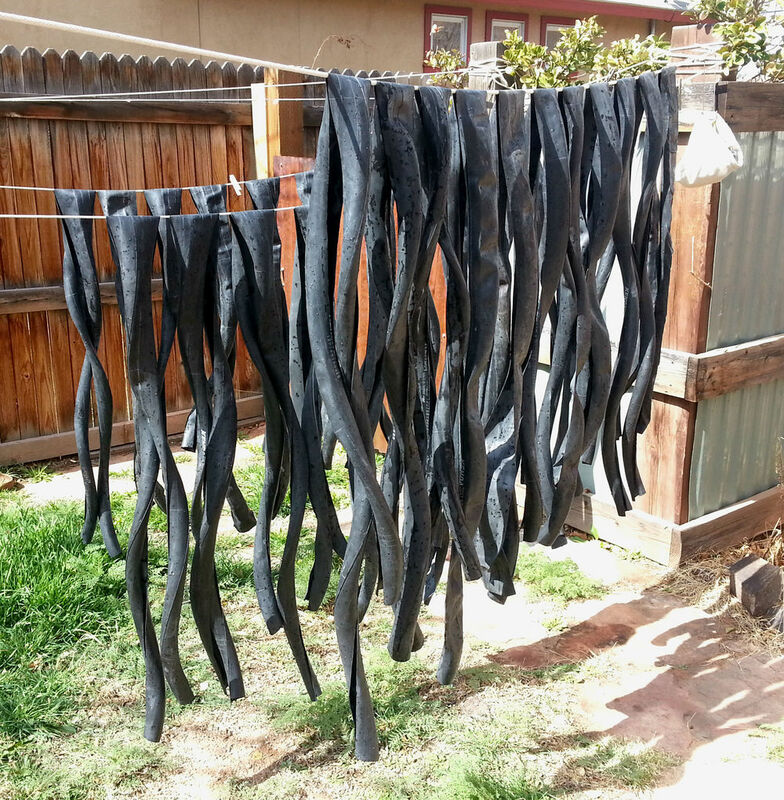 Wondering why bike tubes can't be recycled and made into new tubes? Natural rubber is made more durable via a chemical process called vulcanization, which is generally irreversible. To read more, go here and here. Sign up to receive news, updates, and alerts on sales and new products. These go out once or twice a month. Also, I respect your privacy and won't sell your information.